Those are some seriously harsh words, especially toward an icon of the Internet age. But Bezos has made a habit of forcing naysayers like Einhorn to eat their words. Every time that this sort of complaint has been raised about Amazon in the past—and this moment is hardly an aberration in Amazon’s history—the company has roared back to prove its doubters wrong. Dubbing Amazon just another “bubble stock” can seem shortsighted, even foolhardy. Betting against Bezos has never turned out well. The Fire Phone plan was particularly ambitious, insiders say, with a set of objectives that seemed unrealistic even then. Far from merely trying to dominate online retail, this is a business that now does grocery delivery in San Francisco and Los Angeles; that produces TV shows starring John Goodman and Gael García Bernal; that counts NASA and Netflix as customers of Amazon Web Services; that recently acquired Twitch, a live-streaming service for video games, for around $1 billion; that has launched an all-out offensive against e-commerce rival Alibaba on its home turf in China; and that, as of December, offers its own branded line of eco-friendly diapers. It might soon even be launching a hotel-booking service. How do these increasingly fragmented parts of Amazon fit together? What is Bezos’s strategy? These are the questions that people are now flinging at a company famous for its laserlike focus and outrageous efficiency. Like every product created at Amazon, the Fire Phone began on a piece of paper. Or rather, several typed, single-spaced pieces of paper that contained a mock-up of a press release for the product that the company hoped to launch some day. Bezos requires employees to write these pretend press releases before work begins on a new initiative. The point is to help them refine their ideas and distill their goals with the customer in mind. The Fire Phone plan was particularly ambitious, insiders say, with a set of objectives that seemed unrealistic even then. Look Deep Inside Amazon Game Studios. The project, code-named “Tyto” for a genus of owl, got rolling in 2010, roughly around the time Apple launched the iPhone 4. There were cogent reasons for Amazon to want a phone of its own. As the world goes mobile, an Amazon phone would provide a more direct link to its users. Today, customers often come to Amazon via iPhones or Android devices. Not controlling the hardware can create problems. For instance, you can’t buy e-books through the Kindle app on your iPhone because Apple takes 30% of app-driven sales—a cut that would hurt Amazon’s already razor-thin margin. Bezos knew that any Amazon phone would be immediately greeted with one question: Why should anyone buy an Amazon device instead of an iPhone? That’s why his mandate to the team was simple and bold from the very start: Let’s wow customers with something big and distinctive. ‘In essence, we were not building the phone for the customer—we were building it for Jeff,’ says one source. With Bezos managing every critical decision, teams began second-guessing themselves trying to anticipate how he would react. Bezos’s guiding principle for Amazon has always been to start with the needs and desires of the customer and work backward. But when it came to the Fire Phone, that customer apparently became Jeff Bezos. He envisioned a list of whiz-bang features, and the Tyto team started experimenting with a slew of promising technologies: near-field communication for contactless payments, hands-free interactions to allow users to navigate the interface through mid-air gestures, and a force-sensitive grip that could respond in different ways to various degrees of physical pressure. Perhaps most compelling was Dynamic Perspective, which uses cameras to track a user’s head and adjust the display to his or her vantage point, making the on-screen image appear three-dimensional. Inside Lab126’s industrial design studio, employees sit at tables dotted with Apple Cinema Display monitors and Dell laptops. Streamed in through a Sonos speaker, music fills the open space where the team brainstorms new ideas, reviews 3-D models, and pins up mood boards on the wall. “It’s a fun, lighthearted, and collaborative group,” says one source familiar with the culture. Few employees have access to this studio, which is hidden on the top floor of one of Lab126’s Sunnyvale buildings, with offices fronted by partially frosted glass. “If you really wanted to peek in, you could crouch down and look through the bottom of the window,” jokes one source. Bezos would generally visit for a day or two on his trips from Seattle, casually popping in to say hello to his design team and to meet with Zehr. Closer to the launch of the Fire Phone, his visits became more frequent: At one point, he spent a month basically working out of Lab126. The group’s hardware and design expertise have become more sophisticated since it released the first Kindle e-reader in 2007. That Kindle was a clunky, ugly slab of machinery, but the idea behind it was so original, and Amazon’s development of subsequent versions so relentless, that it became a massive hit. Unique as it was, however, the Kindle was a relatively simple device, especially compared to a smartphone. Lab126 specializes in the kind of bold bets Bezos loves. Each “science experiment,” as those inside the lab describe their projects, is labeled with a letter of the alphabet. (Indeed, Lab126’s name itself is a play on A to Z, with 1 representing the first letter of the alphabet and 26 the last.) These experiments evolved over years of development into a hardware portfolio that now includes Amazon’s Fire TV set-top box and the new Echo, a sort of Siri-in-a-tube that’s engineered to answer any spoken question. Many other projects will likely never come to market, such as Project C, imagined as an experimental device for the home that would project a display screen onto any surface and allow users to interact with it through gestures. Tyto was considered Project B. On stage, Bezos gushed about the phone’s design and showed off how it could recognize paintings. Bezos, insiders say, was “the product manager” on the Fire Phone. (One research scientist refers to him as the “super product manager.”) “Even the very smallest decisions needed to go through him,” says a former senior member of the team that developed the Fire Phone’s cameras, recalling how Bezos personally chose to include a 13-megapixel camera rather than an 8-megapixel one. Bezos was closely involved with developing both the hardware and the software. “I would see him brainstorming wild ideas with the industrial design team, or discussing font sizes and interaction flows with the UI team,” recalls a former topflight designer at Lab126, who describes a demanding pace. “And I thought, This is a CEO who cares about design; what a wonderful place to be.” Eventually, however, this designer grew frustrated, as did others. “In essence, we were not building the phone for the customer—we were building it for Jeff,” this source says. With Bezos managing every critical decision, teams began second-guessing themselves trying to anticipate how he would react. With progress on the phone slow, and its prototypes barely functional, the company decided leading into 2013 to scrap most of the Tyto work and start over. The target launch date was pushed back a year, and Tyto was given the new code name “Duke.” As a backup plan, Bezos also ordered the development of a stripped-down, low-cost alternative to Duke, dubbed “Otus.” Some inside Amazon hoped the company would first launch Otus (which was also known as the “Prime Phone,” because the company was considering giving it away free or selling it extra-cheap to its members), believing that such a low-cost phone was more in keeping with Amazon’s value-conscious brand. Amazon’s victories had always come on the back of aggressive pricing: It was willing to sell products and offer services, such as Prime and its range of Kindle products, at cost—or even at a loss—to win customers and get them buying and consuming more Amazon goods and media. The strategy had enabled Amazon to swallow up entire industries and squash competitors, from Circuit City to Barnes & Noble. But pricing a smartphone was complicated. Bezos didn’t want a me-too device, and the margins a low-cost phone could garner would be minimal, even if it did manage to stand out in an ocean of cheap devices. The only solution, some inside the organization argued, was to differentiate the hardware enough to justify a higher price point and hope to go after some of Apple’s profits. But Apple is a ferocious competitor as well, whose dominance in high-end products was made possible by decades of rigorous R&D, a world-class design team, and its unrivaled approach to hardware and software. The idea that Amazon, a neophyte hardware maker whose CEO has shown no special affinity for design, could successfully attack Apple might seem quixotic. Bezos’s memo helps put the phone project into perspective. Amazon is one of the world’s most admired brands, a constant presence atop surveys of customer satisfaction. But it’s also a company that hundreds of millions of people depend on for good deals on boring products—low-cost paper towels, not a $199 smartphone. The high-end phone would be big, risky, different, and unexpected—not the cheap, unexciting device everyone would anticipate from Amazon. That helps explain why, for example, Bezos ordered the team to gussy up the phone’s Firefly feature, a service that can identify many types of products and media with the click of a button. Hover the phone over a physical book cover, for example, and Firefly can instantly dial it up on amazon.com or in the Kindle store. But Firefly can also be used to determine the name of a song in a bar, or to scan in contact information from a business card. And just one month before launching the phone, Bezos ordered the team to find a way for Firefly to recognize paintings and other works of art. Bezos unveiled the Fire Phone on June 18, 2014, at Seattle’s Fremont Studios. On stage, he gushed over the phone’s design and Dynamic Perspective, and showed off not only how Firefly could recognize a jar of Nutella but also a painting by Renaissance artist Vittore Carpaccio. In late July, the Fire Phone finally went on sale, and it didn’t take long for the company to discover that consumers considered its smartphone effort utterly misguided. Reviewers knocked the device for its gimmicky features, especially Dynamic Perspective, which most found worthless and distracting. They also took issue with the Fire Phone’s bland industrial design and disappointing ecosystem; Amazon simply doesn’t offer the same library of apps or cohesion of services as Apple. But what Amazon got most wrong, they said, was the cost: The Fire Phone was too expensive for its customers. According to three sources familiar with the company’s numbers, the Fire Phone sold just tens of thousands of units in the weeks that preceded the company’s radical price cuts. The $170 million write-down confirmed that the launch has been a dud. Clearly, Amazon isn’t yet on the same side of the “loved” spectrum as the brands Bezos named in his memo. Devoted fans of Apple, Nike, and Disney will spend any amount of money just for a small taste of their products and culture. Amazon certainly isn’t in the same camp as supposedly “unloved” brands like Walmart—far from it. But Amazon just isn’t as cool or beloved as Bezos might hope. Anyone worried about the direction Amazon is headed, and whether the company has abandoned its value-brand intensity in pursuit of some kind of high-class chimera, would have shuddered the night of December 2. A stream of New Yorkers, resplendent in their winter uniform of long black overcoats and plaid scarves, filed into Lincoln Center’s Alice Tully Hall. A live orchestra welcomed the guests. When the lights went down, the actor Jason Schwartzman accompanied Academy Award–nominated screenwriters Roman Coppola and Paul Weitz to the stage, where they thanked—of all people—Jeff Bezos. The occasion? The premiere of Mozart in the Jungle, a comedy series set behind the scenes of a symphony orchestra. The show was produced by Amazon Studios, the company’s original-content arm, which has developed some three dozen pilots in the four years since the company created its video-streaming service. It offers a growing library of Netflix-style content, including original shows available exclusively to Amazon Prime members. Just 17 months ago, in September 2013, this magazine put the Amazon CEO on its cover alongside the headline “King Bezos.” Comparing the initiatives we highlighted then and the list of new ventures in the paragraph above gets to the heart of why so many observers are nervous about Amazon. Back then, Bezos’s focus seemed to be on faster delivery, greater automation in the company’s warehouses, and keeping prices low. His new grocery business seemed to be yet another of those low-margin endeavors at which Amazon has excelled. The intensity and innovation applied to these mundane functions was awe-inspiring. True, the original-content business was harder to grasp, but it was an outlier rather than one of a slew of projects that now beg for explication. What does Jeff Bezos really gain by stretching so far? A great streaming-content library to hook people into Prime makes sense, but should the company really be producing its own original shows? Buying Zappos and Quidsi, with its lineup of e-retail websites like Soap.com and Diapers.com, fits right in, but why does Amazon have to make its own nappies? Even a phone might make sense—but a 3-D phone? Why? Ben Thompson, a widely respected independent technology analyst, has spent much time trying to grasp Amazon’s larger strategy. Recently, he concluded that its big investments in devices and video streaming are increasingly disconnected from its retail business. After Amazon’s acquisition of Twitch, a sort of video-game-centric YouTube, Thompson wrote that it no longer makes sense to view Amazon as an e-commerce company. One theory for Bezos’s apparent strategic shift? “Amazon wants to rule the world,” he wrote in an August 2014 blog post, only half in jest. 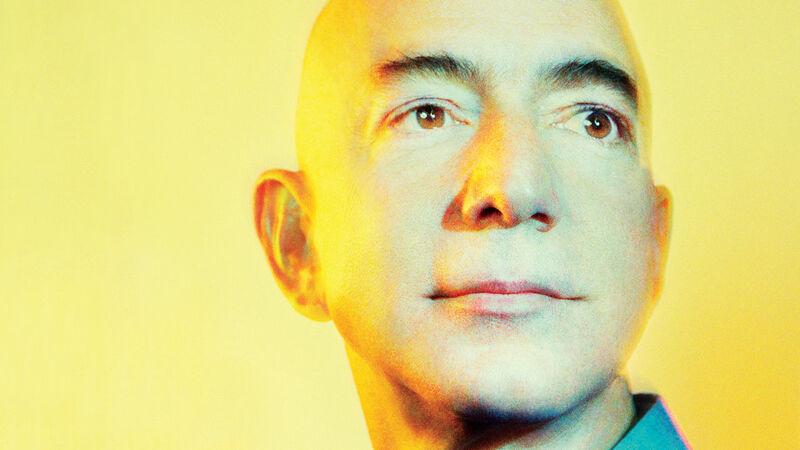 Bezos has always liked to think of himself as an explorer. “Explorers are cool,” he wrote in that Amazon.love memo. Every so often, Bezos takes his company on a daring expedition. These can be expensive and time-consuming, since they are pursued with the vigor Bezos brings to everything he does. And they have often brought home profits, lessons, and ideas that fund previously unimagined sources of future growth. His explorations have led to AWS, which some observers think will be a $25-billion-a-year business by the end of the decade, to warehouse robots, and to a host of smaller innovations that have further strengthened the link between Amazon and its customers. Even Prime Air, the drone delivery project that has been mocked from the outset as an outrageous fantasy that ignored regulatory issues—Bezos painted a picture of a sky full of unmanned aerial vehicles zipping packages to customers in under 30 minutes—has unexpected potential. In the near term, drones, which can operate on a three-dimensional plane, could add yet another layer of efficiency to Amazon’s fulfillment centers (where the FAA has no jurisdiction), augmenting the robots already rolling around the floor transporting goods. The first round of Amazon’s Fire Phone exploration failed, but Bezos will launch more forays, and those may lead to a significant discovery. Some of the existing hardware initiatives have features with considerable promise. The voice recognition in Echo, for example, will likely come to future iterations of the Amazon phone. Imagine that Alexa, as Amazon calls its Siri competitor, finds her way into a slew of devices. She is, really, a voice-powered search engine; if customers like the way she helps them find and order products, Amazon could start to circumvent Google and perhaps even develop a robust advertising business of its own, sitting on top of a powerhouse product-oriented search engine. What investors and Amazon fans want to see is a return to the kind of explorations that better gibe with the company’s historic focus. Amazon must deliver on the promise that at some point it will generate significant profits. If it doesn’t, investors will eventually pull away from the stock—that was the message they sent after the third-quarter earnings report. And if that happens, Amazon will have less money for new initiatives, and its recruiting and retention efforts could suffer as well, because the company has historically relied on stock options, not high salaries, to incentivize employees. That’s why Bezos’s happy embrace of failure, and his insistence on funding even bolder initiatives ahead, has always been risky. There’s one other thing to keep in mind, however. Bezos’s penchant for exploration has almost always been balanced by a deep respect for the fundamental mission of the company. He has recovered from every failure Amazon has experienced in the past, and even after a failure as grand as this one, he has earned the benefit of the doubt, as the majority of my sources told me during interviews. Is the Fire fiasco a dead-set indicator that Amazon is in trouble? Not at all. Toward the end of my reporting for this story, I ventured out to an unassuming building on the Upper East Side in New York, not far from the Central Park Zoo, where a small sign on the exterior marks the Explorers Club. Inside the Wes Anderson–ish space is a museum’s worth of artifacts and gems from the private club’s storied 111-year-old history, such as gloves from the first moon landing. It’s long been an exclusive meeting place for the world’s most daring explorers, scientists, and thinkers—club director Will Roseman matter-of-factly tells me no less than three religions have been founded here—and over the years, its elite roster of members has grown to include Sir Edmund Hillary, Buzz Aldrin, Charles Lindbergh, James Cameron, Elon Musk, and, yes, Jeff Bezos. If you ever get a chance to visit the Explorers Club, and you manage to get past the massive stuffed polar bear, take a gander at the wall featuring photos of some members that the club has honored. Bezos was commended in 2014 after his company Bezos Expeditions used its technology to retrieve jettisoned Apollo 11 F-1 engines from the depths of the Mariana Trench. You’ll know you’re getting close to Bezos’s picture when you see the triumphant photo of Musk, hands folded on his chest beneath that bold stare of his. Just to Musk’s left is a picture with dozens of small figures. Those are the members of Bezos’s crew, standing on the deck of a ship, and if you squint hard, you can see the boss over to the right, wearing work boots, a windbreaker, and a baseball cap. There’s nothing remotely heroic about his pose. Bezos told the club’s directors that he wouldn’t accept an award for the Apollo effort unless each of his Bezos Expeditions colleagues also received a citation, highly unusual for this elite organization. The picture is the only one featuring a group of people. This is the Jeff Bezos people want to see again. The guy in work boots, who always seemed willing to go anywhere and work harder than anyone at the jobs no one else really wanted to do. Amazon is admired by customers for what it does, rather than loved for some iteration of itself that Bezos has clearly desired. The world doesn’t need another Steve Jobs. They just want Jeff Bezos, the way he used to be. Amazon Plugs In: How The e-retailer’s Hardware Efforts Stack Up. Kindle Voyage ($199)Like its predecessors, dating back to the original in 2007, Amazon’s newest Kindle is purely for reading. With its thin case, high-resolution screen, and six-week battery, it’s the most refined e-reader ever built. Fire HDX 8.9 ($379) Amazon’s tablet strategy is simple: Sell ’em cheap and make money when owners buy content. The HDX 8.9 is particularly impressive, but Amazon’s Appstore isn’t nearly as stocked as the iOS App Store and Google Play. Fire TV ($99)A slick device, but way late to a category dominated by Roku and Apple TV. It lets you search by speaking and is surprisingly serious about gaming. Still, it’s no match for Roku’s 1,800-channel content smorgasbord. Fire TV Stick ($39) An impulse-item nub of a gizmo vaguely akin to Google’s Chromecast but bundled with a remote control. Basically the Fire TV box minus the higher-end games, and voice search requires a smartphone app. Fire Phone ($.99 with contract) Amazon’s first smartphone is hardly a me-too product. However, its interface is gimmicky and garish, making it a quirky outlier rather than a true rival to Apple and Samsung. Echo ($199) An always-listening, Siri-esque assistant named Alexa lets you speak commands to create playlists, set alarms, or check the weather. Amazon is rolling out Echo via a low-key, invite-only program.